This was my second stay at Shambara. I stayed there before, on my first trip to Thailand in 2006. Not a lot has changed: there are still only 9 rooms, the bathroom is still shared, footwear is still strictly not allowed inside, and it’s still always full. Shambara’s biggest appeal is its location: it’s in an alley off Khao San Road. If you’ve been to Bangkok or have researched about the city, you’d know that KSR is the backpacker’s hub. 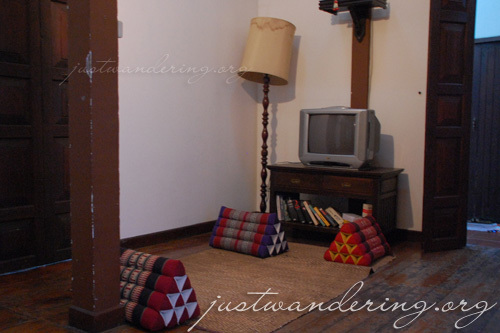 This is where most of the young and first time backpackers go to stay in Bangkok, because everything a traveler needs is in Khao San Road. Cheap accommodation? Check. Clothes and accessories? Check. Bootleg CDs and DVDs? Check. Foreign exchange and ATMs? Check. Pharmacy and convenience stores? Check. Travel agents offering cheap tour packages to Thailand’s islands and beaches? Check. Restaurants and bars serving Western food and cheap booze? Check. 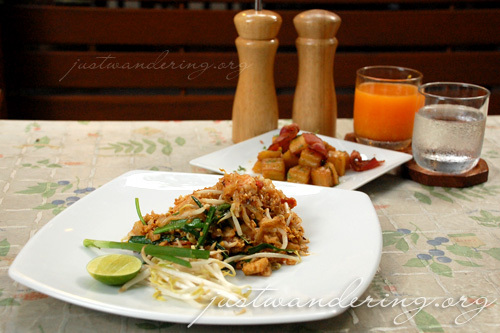 Thai street food? Check. McDonald’s, Starbucks and Apple Store? Check, check, check! Basically, if you want to meet other backpackers and party until sun up, you go to Khao San Road. Of course, the problem with party places is that it can get really noisy at night, which is bad if you need to get some sleep for your early flight to Krabi. That’s where Shambara is at an advantage. Since it’s in an alley, KSR is close enough that you’re literally just a few steps away from the party, yet far enough not to hear it in your room. Another great thing about staying in Khao San Road is that it’s near some of the main tourist attractions of Bangkok: The Grand Palace, Wat Phra Kaew (Temple of the Emerald Buddha), Wat Po (Temple of the Reclining Buddha) and Wat Arun (Temple of the Dawn). The first three are just one bus ride away, while Wat Arun requires a ferry ride across the Chao Phraya River. For me, that’s another appeal of staying at Khao San: the Chao Phraya River express. When I’m feeling cheap and not too lazy to walk to the ferry stop, I’d take the river express down to Sathorn station, where I board the BTS going to the malls. Though it’s much easier and the route’s much direct if I take a cab, I like the novelty of riding the ferry down the river. Also, I don’t have to deal with the terrible Bangkok traffic. Oh wait, I’m supposed to be writing about Shambara. The room I got on my last trip was so identical to the room I stayed in before. Actually, I think it IS the same room I had before: single room with aircon. As I said in my previous review, the room is just right for one person. There’s enough room for my mess, and I love that there was a small side table for my phones, medicine and bottled water (I was sick when I stayed there last June). There was a narrow ladder-like thing for hanging clothes and an electrical socket for electronics. Save for that missing jalousie panel on my window, the room was still the same shape as the last time I slept there. Surprisingly, after 3 years, Shambara still looks and feel the same. I love it. There are places that seemed so different and depressing after just a year, so it was great to find out that Shambara has kept the quality of their boutique hostel. Since I stayed longer last June, I was able to try eating at Shambara’s restaurant. They had an outdoor and indoor dining area. While al fresco dining seemed like such a quaint idea in the late afternoon or in the evening when there’s mood lighting, there are mosquito and other insects that come from the trees and plants. They put mosquito coils, but if your blood’s really tasty to them bloodsuckers, be sure to slather a healthy amount of repellent before heading there for dinner. The food was good, though not spectacular. It’s pretty pricey, specially since there are plenty of cheaper and better alternatives in Bangkok. If you love pulp though, I suggest you try their fresh orange juice. It’s like 90% pulp, 10% juice. If you want to stay in the Khao San Road area, I highly recommend staying at Shambara. However, if you ask me where to stay in Bangkok without specifying a locale, I would recommend a different place. Shambara advertises that they have wi-fi in the guesthouse. When I was there, however, I was told the hostel’s Internet was in the fritz, therefore no-wifi for the guests. It was just as well, because it turns out, there’s an additional fee for wi-fi access (and only for a limited time). They also offer a laundry service — THB 150 for a load of laundry. I find that this is too pricey, specially if you don’t have that many clothes. Better to take your laundry to the laundry shops. apir for that note “Before you add that comment”! Dyanie: Nakakarindi na kasing sumagot ng tanong na paulit ulit lang :P May mga nagagalit pa at nagrereklamo! 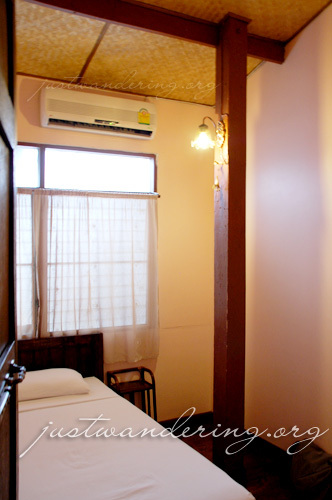 I’d like to book one double&fan Jumbhee(white champak) OR CHA BA(SHOE FLOWER)room for the coming Feb 13th to Feb 15th (check in on Feb 13th and check out on Feb 15th ). My name is Dan Wu, coming from China. I’ll fly from CEI to Bangkok on Feb 13th, arriving time will be 22:55pm with the flight No.FD3257, PLS keep the booking until 24:00. many thanks. If the booking succeeded, pls send me the confirmed email to judiewu1982@yahoo.com.cn, thanks. Your blog is great! Very helpful! However, if you ask me where to stay in Bangkok without specifying a locale, I would recommend a different place. – Where?